This book aims to mark fifteen years of contributions to the field of style research in cognition and learning presented at the annual conference of the European Learning Styles Information Network. The style field is a multidisciplinary, global community made up of researchers in several domains of knowledge including education, psychology, business, computer science, information systems, management, human resources and other related fields. The book will be relevant for readers who are interested in differences in thinking and learning, covering a wide range of style-related themes with appeal to readers seeking an international and interdisciplinary perspective. Interested practitioners will include professionals working in the areas of HR Management, Organizational Learning, Business Management and all phases of Education. The application of style differences, for example, impacts widely upon work and human performance in areas of policy-making, team-management and project development (sports, social agency, and medicine). New or alternative research paradigms facilitating revision and consensus in the field of style differences are presented. The aim of integrating research and practice is developed to achieve consensual theory for style differences in human performance. 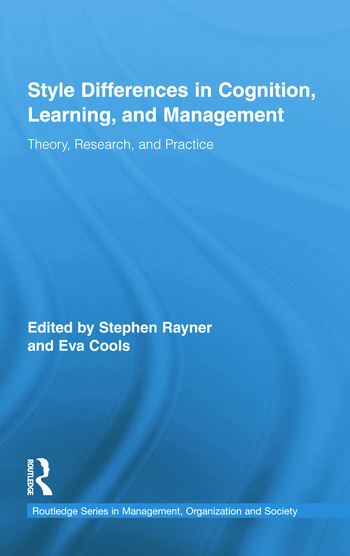 Style Differences in Performance is a timely and field-defining volume that will change the way academics and practitioners across international and disciplinary boundaries think and talk about the field of learning style and its implications for human achievement. Steve Rayner is Professor of Education at Oxford Brookes University (UK). He is an internationally recognised scholar in the study of individual differences in learning, leadership and the management of inclusive education. Publications include work in the study of cognitive style; personalizing pedagogies associated with style-led learning; educationists’ learning leadership in doctoral study; and investigating academic leadership in the ‘UK University’. Eva Cools, PhD, works in the People and Organization department of Vlerick Leuven Gent Management School, Belgium. She is Research Officer of the European Learning Styles Information Network (ELSIN). Her current research activities focus upon cognitive styles, person-environment fit, styles and learning within the context of management education.